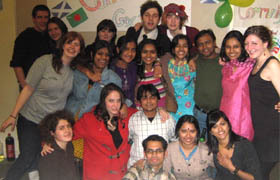 Community farewell on Friday, 28 November, 2008 marks the last day of Global Xchange (GX) Team 79 in Caithness. The community farewell provides an opportunity to say Thank You and Goodbye to the Host Homes, Volunteer Placements, and Friends in Caithness. The farewell started with dinner which followed by an outstanding cultural programme. Music, multicultural performances and experience sharing, along with raffle draw are scheduled to make the last day a memorable one capping three months in the community. 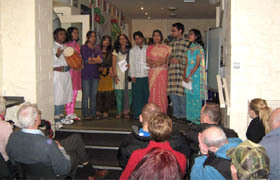 The poetry, song, dance was filled with the various elements of Bangladeshi and Scottish culture marked by the vibrant colours depicting the villages, the costumes, music, dances. Simple video and slideshow were shown as the last activity of the programme. The presentation reflects interesting insight of GCD, CAD, Community Welcome and other social activity. The volunteers are looking forward to go to Bangladesh and exploring a new culture. They will spend three months in Chittagong and stay at 10 host homes. Apart from staying with the Host Home they will work with nine local organizations as well as local communities.